All products listed here are also available for subscribing members. To access all my lessons immediately, Join MGA, and see what I offer. Scroll down to see some huge bundle savings. Video, Tablature, Guitar Pro, Backing Track. 25 Tracks in the 7 natural keys + B flat. There is one extra jam track in the key of E to make it 25. 26 DVDs - You Got To Help Me; Easy 12 Bar Blues Solo; Advanced 12 Bar Blues Solo; Triad Voicings; Comping with Triads; St. James Infirmary Blues; Voicing & Comping the Blues; Jump Your Blues; 14 Licks in 7 Keys; Fretboard Finding Fun; Robben Ford Style Funky Blues, Scales You Can Use When You Play The Blues; Cool Riffs 2; Slow 60 Blues; Introduction To The Blues; Bar Blues 1; 12 Rock Guitar Licks and Rhythm; Lick Of The Week 1; Lick Of The Week 2 + Lick Of The Week 3 + Cool Riffs 1 + Jingle Bells Blues + DVD Dolphinstreet 4. Huge savings compared to buying them individually. Over 45 hours of fun. BONUS: You also get a 12 month membership to MGA! All my Downloadable Products combined. Over 45 hours of lessons. Warning - BIG download! Will take many hours to download. Includes 1 year MGA membership as well. 6 Blues Lessons at 60% off. 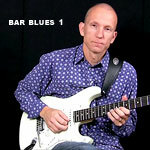 Easy 12 bar blues - Advanced 12 bar blues - Jump Your Blues - Robben Ford Style - Bar Blues 1 - Slow 60 Blues. Huge download - will take many hours to download. This bundle includes 4 DVDs + the download. 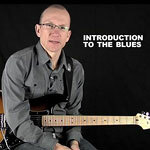 Introduction To The Blues + Bar Blues 1 (24 blues licks + rhythm guitar) + Slow 60 Blues + Scales You Can Use When You Play The Blues. Comes with Guitar Pro files, backing track and TAB files. Instant Download included as well! This gives you nearly 8 hours of video. Save $45 on buying them separately. LOTW 1 & 2 & 3 in a bundle. You get 51 Licks - 6 hours, 35 minutes in total. The 3 DVDs ships within 2 business days. LOTW 1 & 2 & 3 in a bundle. You get 51 Licks - 6 hours, 35 minutes in total. BIG download - over 6 GB! 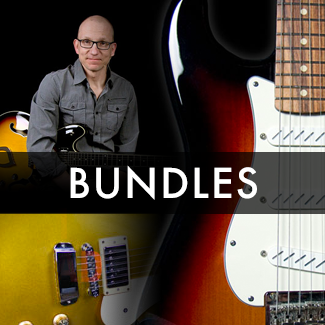 Cool Riffs 1 & 2 Bundle - over 3 hours of fun lessons. This is the DVD version (2 DVDs). 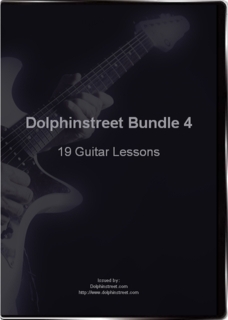 Cool Riffs 1 & 2 Bundle - over 3 hours of fun lessons. This is the download version. 48 bars long. Over 1.5 hours. Comes with 4 videos, 3 mp3 files, tablature, Guitar Pro, notation, BIAB file. Size of download: 2.3 GB BONUS: 6 Killer Licks Included! 1.3 GB zip file. Included are mp3 files, Tablature, Guitar Pro files and 6 videos. You will learn the solo, the rhythm guitar, and there is also a lesson on technique and tone. 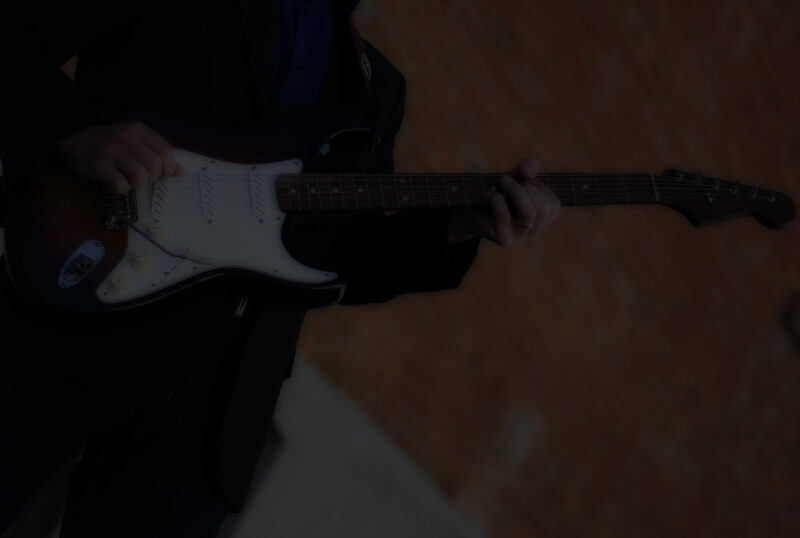 Performance video, Tablature, Guitar Pro, backing track, performance track. Learn a full T-Bone Walker style tune, complete with Melody, 48 bar long Solo, and Rhythm Guitar. 5 mp3 files, Tab & Guitar Pro files, 9 videos. Total length: 65 minutes. Length: 1.5 hours. Also included via separate download: 5 mp3 files, Tab and Guitar Pro files. A 2nd download link is also provided, which has the complete (big) download - 1.7 GB. 13 Videos, 5 mp3's, Tab and Guitar Pro files. Download size: 1.7 GB. Length: 1.5 hours. 6 Videos, 2 backing tracks, performance mp3's, Tab and Guitar Pro files. Download size: 585 MB. 6 Videos, Tab, Guitar Pro, Backing Track, Performance Track. Download size: 638 MB. 5 Videos, Tab, Guitar Pro, Backing Track, Performance Track. Download size: 511 MB. Comes with Video, Tab, Guitar Pro, mp3 tracks and a PDF handout, explaining the 5 Blues Boxes. Total size of download: 1.4. GB. 1 hour and 18 minutes in total. Comes with Tab, Guitar Pro, mp3 tracks and a PDF handout, explaining the 5 Blues Boxes. Comes with 7 Videos, Tab, Guitar Pro, and mp3 tracks. Total size of download: 1.19. GB. 1 hour and 5 minutes in total. Comes with 7 Videos, Tab, Guitar Pro, and mp3 tracks. You also get the video download included. Lesson files provided as a download. 1 hour and 5 minutes in total. DVD will be shipped within 5 business days. Length: 26 minutes. Comes with 3 Videos, Guitar Pro & TAB. Download size: 480 MB. Length: 50 minutes. Comes with 3 Videos, MP3, Guitar Pro & TAB. Download size: 808 MB. 22 videos - 6 backing tracks - TAB and Guitar Pro files. 3 hours, 16 minutes. 3.2 GB Download. Comes on 2 DVDs and also includes the Full Premium Download. 22 videos - 6 backing tracks - TAB and Guitar Pro files. 3 hours, 16 minutes. 3.2 GB Download. Length: 27 minutes. Comes with 4 videos, Guitar Pro, Tab and MP3's. Download size: 465 MB. 20 videos, Backing Tracks, MP3's, Tab, Guitar Pro. Size of download: 1.6 GB. Total length: 1:33. 20 videos, Backing Tracks, MP3's, Tab, Guitar Pro. Total length: 1:33. 5 Videos, Tab, Neck Diagrams for all triads and examples. Length: 61 minutes. Size: 1 GB. Comes with 13 Videos, Tab, Guitar Pro, mp3 tracks and neck diagrams. Total size of download: 3.1 GB. 2 hours and 56 minutes in total. The 2 DVDs will be mailed to you within 2 business days. The accompanying lesson files are provided as a download. One of my most popular song lessons. 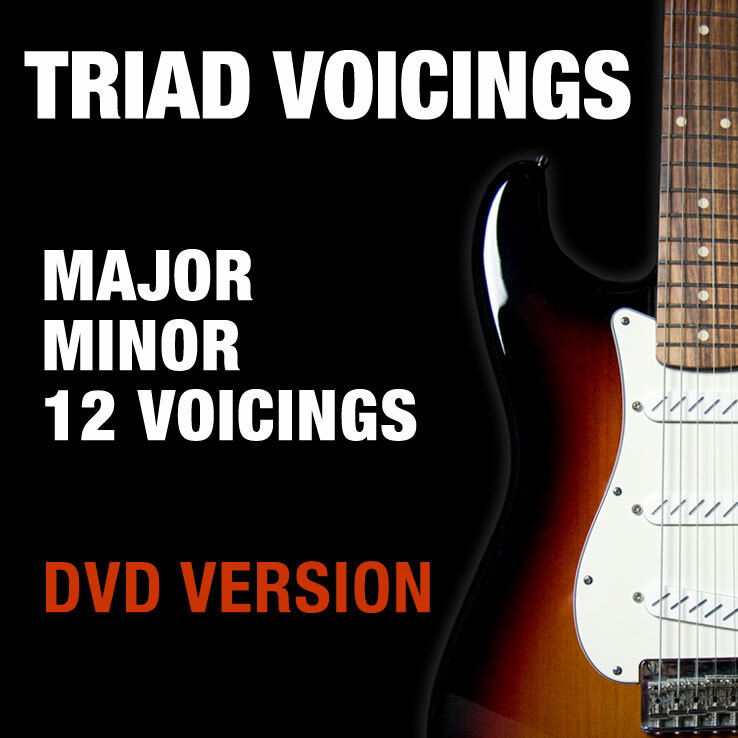 Comes with 13 Videos, Tab, Guitar Pro, mp3 tracks and neck diagrams. Total size of download: 3.1 GB. 2 hours and 56 minutes in total. Learn the Head (Melody), Chord progression, Chord Inversions, Comping, and a 36 bar long solo. Comes with TAB, Guitar Pro, Mp3, Video. Download size: 1.6 GB. Length of lesson: 1:38. DVD version + Direct Full Download. Learn the Head (Melody), Chord progression, Chord Inversions, Comping, and a 36 bar long solo. Comes with TAB, Guitar Pro, Mp3, Video. Download size: 1.6 GB. Length of lesson: 1:38. Comes with 2 downloads - the full Download, and the lesson files only. Got Some Mojo Working: a fun, funky blues in A. Also included is a lesson on playing with Open G tuning - riffs and a 12 bar blues. 1:44 in total. 1.8 GB in size. Intermediate level. Got Some Mojo Working: a fun, funky blues in A. Also included is a lesson on playing with Open G tuning - riffs and a 12 bar blues. 1:44 in total. The Big Download is INCLUDED, as well as the lesson files WITHOUT the video. Intermediate level. DVD + Video Download. A fun, straight blues. The first part focuses on strumming in a funky way. The second part is an Intermediate solo. The third part is a challenging and hip Advanced solo. Comes with backing tracks, solo tracks, Guitar Pro, TAB, and detailed breakdowns of all licks and strumming patterns. 2 Hours, 21 minutes. The DVD is sent within 2 business days, but you also get the full download instantly delivered to you. A fun, straight blues. The first part focuses on strumming in a funky way. The second part is an Intermediate solo. The third part is a challenging and hip Advanced solo. Comes with backing tracks, solo tracks, Guitar Pro, TAB, and detailed breakdowns of all licks and strumming patterns. 2 Hours, 21 minutes. 2 DVDs, includes the Big Download as well. Learn 14 licks in 7 keys, plus Fretboard Finding Fun - learning the 7 natural notes all over the fretboard. Comes with backing tracks, TAB, Guitar Pro and neck diagrams. Over 3.5 hours of video. Learn 14 licks in 7 keys, plus Fretboard Finding Fun - learning the 7 natural notes all over the fretboard. Comes with backing tracks, TAB, Guitar Pro and neck diagrams. Over 3.5 hours of video. WARNING - Big download - over 3.4 GB. Scales You Can Use When You Play The Blues - DVD + Direct Download. 1 hour, 45 minutes. Comes with 11 page Handout, Backing Track, TAB and Guitar Pro files. Download size: 1.8GB. DVD shipped within 2 business days. You also get a 20 minute additional Bonus lesson on the Major & Minor Pentatonic. Scales You Can Use When You Play The Blues. 1 hour, 45 minutes. Comes with 11 page Handout, Backing Track, TAB and Guitar Pro files. Download size: 1.8GB. You also get a 20 minute additional Bonus lesson on the Major & Minor Pentatonic. 5 Fun Riffs to learn, in the style of: Tore Down, All Along the Watchtower, Chitlins Con Carne, Hide Away, Train Kept a Rollin. 1:56 in total. 2 GB in size. Intermediate level. 5 Fun Riffs to learn, in the style of: Tore Down, All Along the Watchtower, Chitlins Con Carne, Hide Away, Train Kept a Rollin. 1:56 in total. 2 GB in size. DVD sent to you in the mail. Intermediate level. 3 Fun Riffs to learn: Rockin My Blues 1 & 2, Boom Boom, Sharp Dressed Riff. 1 hour and 13 minutes in total. Beginner to Intermediate level. 3 Fun Riffs to learn: Rockin My Blues, Boom Boom, Sharp Dressed Riff. 57:44 in total. 1.2 GB in size. Beginner to Intermediate level. This is a 60 minute DVD with 2 lessons. 1) Jingle Bells Blues, a 40 minute lesson that comes with TAB built into the video. You also get 3 versions of the backing track, separate TAB files, and the Guitar Pro 6 file. The lesson covers the rhythm guitar, melody for both verse and chorus and a fun solo that consists of 10 sweet licks. You will get a link to download a zip file with the above files - 505 MB in size. The DVD comes in the mail. 2) A 20 minute lesson about combining Minor and Major Pentatonic when playing lead over an A7 chord. This is a 40 minute lesson that comes with TAB built into the video. You also get 3 versions of the backing track, separate TAB files, and the Guitar Pro 6 file. The video is a Quicktime movie with Chapters, so you can quickly navigate between sections and licks. The lesson covers the rhythm guitar, melody for both verse and chorus and a fun solo that consists of 10 sweet licks. This is a zip file that is 505 MB in size. BONUS - a 20 minute lesson on Minor & Major Pentatonic. Learn how to play The Blues. Comes with Guitar Pro files, backing track and TAB files. Extensive TAB on the screen for all examples. 1.2 GB download. 2 hours of video. Includes Digital Download version + DVD mailed to you. 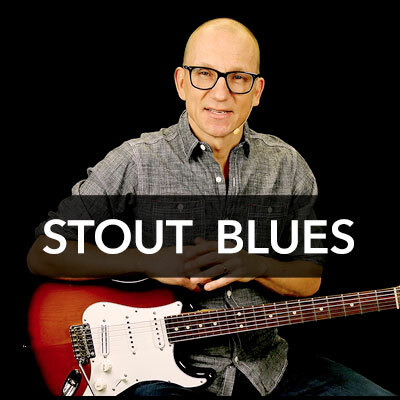 This lesson teaches you 24 great blues licks, as well as the rhythm guitar parts. 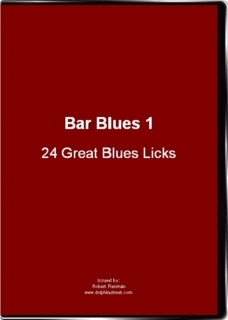 The reason I called it “Bar Blues”, is that each lick spans 2 bars. You will learn 4 licks over bars 1-2, another 4 licks over bars 3-4, and so on. This lesson teaches you 24 great blues licks, as well as the rhythm guitar parts. The reason I called it “Bar Blues”, is that each lick spans 2 bars. You will learn 4 licks over bars 1-2, another 4 licks over bars 3-4, and so on. The result is that you learn good blues licks that are played in the right context. Size of download: 800MB. Learn 12 Rock Guitar Licks + rhythm guitar. This DVD will be shipped to you within 1-3 days. You also get an email link to download the video files, TAB pdf's, GP6 files and mp3 files. The DVD is 60 minutes. It is not region-encoded. Learn 12 Rock Guitar Licks, as well as the rhythm guitar part. Each lick is demonstrated in detail, and there is TAB on the screen for both the guitar licks and the rhythm guitar. A fun lesson I am sure you will enjoy, if you like this style of playing. 3 fun blues lessons - beginner to intermediate. 1) I Got It, beginner, 222 MB download. 2) Line It Up, intermediate, 156 MB download. 3) Get Close, intermediate, 287 MB download. Includes Guitar Pro 5 files, backing track and Tab. A 44 minute lesson on learning and practicing the 7 positions of the C Major Scale. Comes with backing track, performance mp3's, neck diagrams, Tab and Guitar Pro files.